I’ve got yer country summer playlist right here. This week’s listening stack is brimming with breezy, uptempo, smile-a-minute singles that are just right for sunny weather. 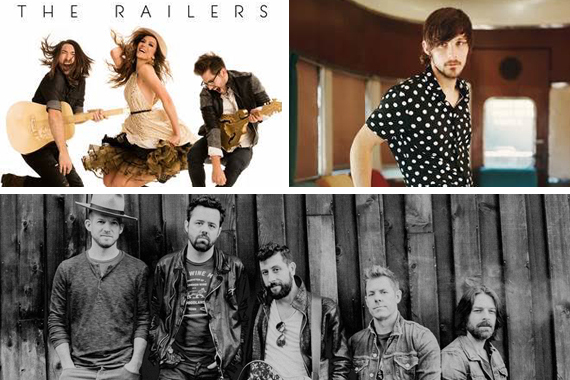 High Valley, Old Dominion, Canaan Smith, Charlie Worsham, Randy Moore and The Railers all popped up with summertime sounds at exactly the same time. Old Dominion and Charlie Worsham finished in a dead heat for the Disc of the Day prize. The Railers rule as the DisCovery Award winners. I know, I know: They’re not brand new. But it has been three long years since they were first in “DISClaimer,” so they might as well be. – Jaunty, catchy and tropical sounding. Very much in the island/Buffett/Parrothead groove. His vocal delivery is loaded with warmth. – This is a male-female country duo from Asbury Park, NJ. She sings lead in a throaty, emotive tone on this plea to end heartbreak. His production is atmospheric and airy. – The verses are cast in a moody, lower-register voice. Then the choruses explode with much more intensity. The lyric addresses a rounder who is going to get his comeuppance from a gal one of these days. – Like much of their music, this is fairly rocked up. Lots of electric guitar in the mix and an overall rowdy vibe. Writers: none listed; Producer: none listed; Publishers: none listed; Warner Bros.
– Irresistibly infectious. This bopping party ditty is a perfect summertime sound. Stay up all night with these happy kids. Writers: none listed; Producers: Frank Liddell/Eric Masse; Publishers: none listed; Warner Bros.
– I remain a fan. His earnest tenor vocal performance is matched with a breezy track that pushes the tempo onward and upward. Luscious, lustrous, lilting listening. – Pensive and powerful. He finds himself loved and cherished beyond anything he deserves. The ballad swells with strings and steel as he caresses each line. – I love the burbling, bubbling rhythm track. The sunny, upbeat, chin-up lyric is packed with supercool advice, notably, “You gotta love like there’s no such thing as a broken heart.” Not to mention, “Chase after the dream, don’t chase after the money.” I guarantee that this little record is going to make you feel good, good, good. – The handclaps are delightful, and the tempo is undeniably compelling. This toe tapper is an instant add, and ya gotta love that. – Romance in a sunny, super-positive light. It’s not the deepest thing I’ve ever heard, but it is effortlessly appealing.